When you were 12 years old, you probably weren’t on stage with actress Elle Fanning and “Glee” star Alex Newell at the 24th Annual GLAAD Media Awards. But if your name is Jazz, that’s just another night in the whirlwind ride that is your life. 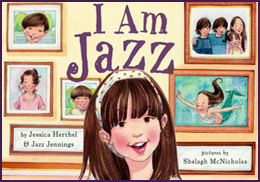 Jazz is a 12-year-old trans advocate who was the subject of the OWN documentary “I Am Jazz” and has been interviewed by Barbara Walters. She has been sharing her story in the media in hopes of building understanding of trans issues. Jazz was prevented from playing soccer on the girls’ team, and her story led to policy changes for all future trans players within the US Soccer Federation. 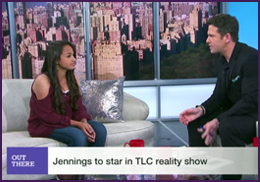 Even though, as Newell notes in the video, there were only two transgender character on TV this year, we also believe that “there are so many impactful stories from the trans community that we want everyone to experience.” She has had some pretty incredible experiences before, but Jazz said she was especially “honored to represent the voice of transgender children, many of whom are too afraid to speak on their own.” With that in mind, we asked Jazz to share her story about coming out as transgender, and she also shared some words of wisdom from Dr. Seuss and talked about meeting Bill Clinton AND Jennifer Lawrence. Check out our Q&A with Jazz after the video! 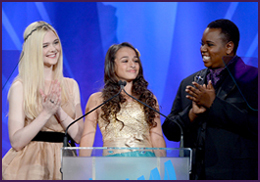 Jazz giving her speech at the LA GLAAD Awards alongside Elle Fanning and Alex Newell. 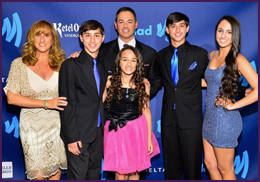 Jazz walking the red carpet at the LA GLAAD Media Awards. Jazz with Academy Award Winner, Jennifer Lawrence. 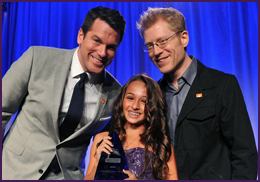 ACT: How did it feel to speak at the GLAAD Media Awards? JAZZ: It was amazing to speak at the GLAAD Media Awards, especially since there were so many important people in the room. 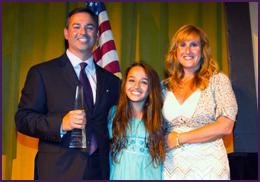 I was honored to represent the voice of transgender children, many of whom are too afraid to speak on their own. I hope that everyone who attended the GLAAD Media Awards can help make the lives of trans youth easier in the future, by spreading our message. ACT: Who was the most exciting person that you met that night? Photo: Bill Clinton requested to meet Jazz. JAZZ: It’s hard to top meeting the former President of the United States of America, so that was definitely the highlight of my night. 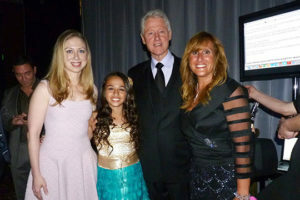 I was honored that he and his daughter, Chelsea, took the time to meet me and my mother. But I’m such a big fan of Jennifer Lawrence that it was so exciting to get to talk to her, too. 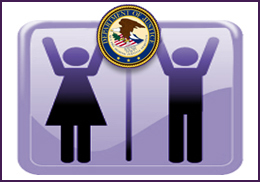 ACT: Do you have any advice on how someone can support a transgender relative or friend? JAZZ: Well, I say this a lot, but I like the quote by Dr. Seuss: “Be who you are, and say what you feel, because those who mind don’t matter and those who matter don’t mind.” So, if you have a transgender friend or relative, be that person who doesn’t mind, and always be there for them. Smother them with unconditional love and don’t ever judge them for being true to themselves. ACT: What kind of support do you hope to see for the trans community over the next year or so? 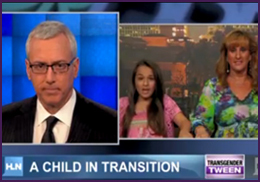 JAZZ:In the past, there were hardly any organizations fighting for the rights of trans kids. But now, it’s comforting to know that trans youth who are discriminated against can turn to groups like GLAAD to help raise awareness and show the world that kids like us don’t have the same rights as other children just because we are transgender. I wasn’t allowed to use the girls’ bathroom at school for five years, and I was banned from playing girls’ soccer for over two years. I’m hopeful that in the future more policies will be changed to support the rights of trans youth. ACT: What is your advice on coming out as trans? Who can trans youth turn to for support? JAZZ: Look for a friend, a relative, a cousin, a teacher, a guidance counselor, a coach or anyone that you trust and you know will give you the support you need and help you in your journey. Because let’s face it, sometimes it’s the parents who aren’t accepting and supportive the way they should be. Also, there are many organizations out there to help trans youth. Find a Gay-Straight Alliance (GSA) at your school or one of the local schools. Or, if you are feeling really sad or even suicidal and need someone to talk to, The Trevor Project phones are open 24/7. I know that GLAAD is helping to put together a new PSA, “I AM: Trans People Speak” PSA series, which shares positive stories about the trans community. I even made a video about being transgender that will be added to the PSA. I hope it helps a lot of transgender people. LGBT Voices: What does pride mean to you?